It is common to encounter patients with missing teeth in the dental clinic. Teeth may be absent due to various causes. One of the important intriguing causes for which investigations of some sort are advised is congenitally missing teeth. The prevalence of congenitally missing teeth is quite variable. It varies among different races and probably from country to country. Some studies have recorded an overall prevalence to range from 2% to 16.3%.,, It is stated that congenitally missing teeth or hypodontia may be associated with certain syndromes or genetic disorders to a certain higher degree, while it is common to find it in otherwise healthy individuals, in nonsyndromic individuals, as a familial occurrence or an isolated phenomenon. A 42-year-old male patient, who worked as an engineer for a government organization, visited with a complaint of sensitivity in the mandibular right posterior region of 1-week duration. A history revealed that he had undergone restoration of the same tooth 5 months ago and he had been only recently experiencing sensitivity for cold fluids. Examination of his oral cavity revealed secondary caries in mandibular right second premolar with no sensitivity on percussion. Furthermore, fixed partial denture in the maxillary right posterior quadrant and partially edentulous left maxillary and mandibular arches were noted. Incidentally, it was noticed that the patient had only single maxillary central incisor, on the left side, with the right central incisor missing clinically [Figure 1]. The right lateral incisor had erupted in the place of central incisor and there was no evidence of any diastemata. 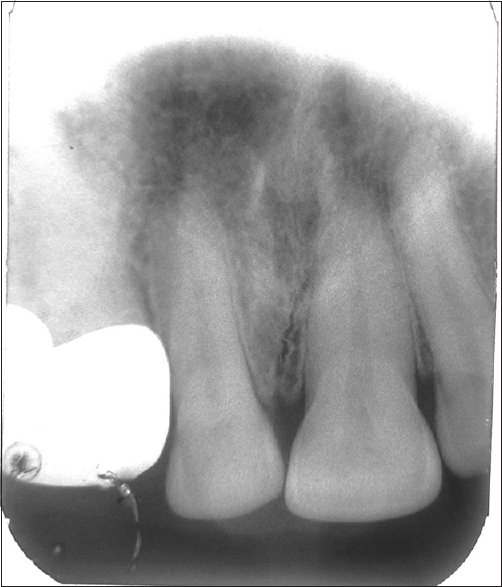 The patient was questioned about any history of extraction or avulsion of the tooth, which the patient totally denied. Furthermore, he recalled that he was taken to a dentist at the age of 10 years, by his parents, for evaluation of noneruption of the same tooth for which no investigations or treatment was advised. He further informed that the dentist who fabricated the denture 3 years back had also questioned him about the same but had not advised any radiographic investigations. Hence, as there was a history of noneruption of the tooth and no history of extraction or avulsion, it was clinically diagnosed as impacted maxillary right central incisor. Clinical differential that was considered was the solitary median maxillary central incisor (SMMCI) syndrome. An intraoral periapical radiograph (IOPAR) and a panoramic radiograph were advised. The IOPAR revealed no evidence of the impacted right central incisor [Figure 2]. In addition, the intermaxillary suture was present in the midline. 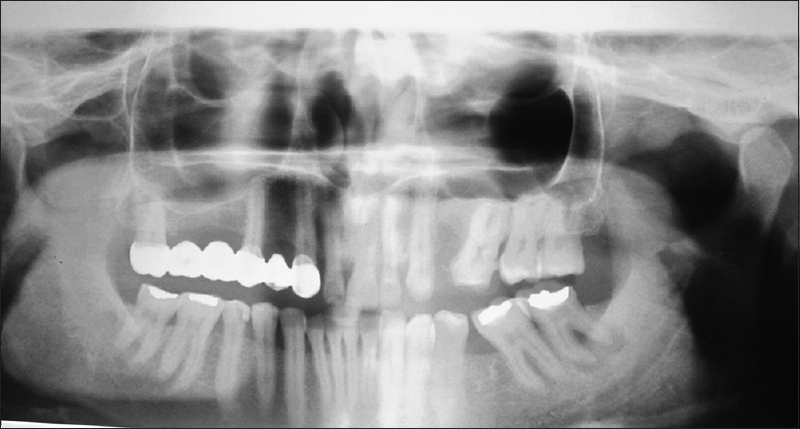 The panoramic radiograph showed no evidence of ectopically impacted maxillary right central incisor [Figure 3]. The maxillary left maxillary incisor had the morphology of a normal central incisor and was present on the left side of the midline. Furthermore, the maxillary labial frenum and incisive papilla were present, and the palate showed no abnormalities. A history also revealed that the patient had no other systemic diseases and was otherwise healthy. Based on the history and clinical and radiographic features, the case was diagnosed as congenitally missing maxillary right central incisor. The patient further received treatment for his complaint along with oral prophylaxis. Hypodontia is the clinical synonym for congenitally missing teeth, when the number of missing teeth may range from 1 to 6. The overall prevalence of hypodontia may range from as low as 0.3% to as high as 36.5%. Various studies have identified a prevalence of hypodontia as follows: Saudi Arabia 11.3%, Irish population 11.3%, Turkey 7% and Iran 9.1%., One Indian study found the prevalence to be 16.3%. There is a general agreement that congenitally missing teeth are more common among females than males. In addition, it is more common in the maxillary arch than the mandibular. The maxillary lateral incisors are the frequently missing teeth, followed by the mandibular lateral incisors, while some other studies have reported the mandibular second premolars, the maxillary lateral incisors, and the maxillary second premolars to be missing commonly. Most of the studies done so far have not found congenitally missing maxillary central incisor or the prevalence is very low, making it the least possible tooth to display agenesis. One study found only one congenitally missing maxillary central incisor in a sample of 1236 orthodontic individuals., Hence, what is being reported here is an extremely rare tooth agenesis. Although some anecdotal case reports, have dealt with the management of congenitally missing maxillary central incisor, an in-depth epidemiological study to identify the prevalence is not available. Studies have shown that agenesis of teeth is transmitted as autosomal dominant trait, while some studies have also said that monozygotic twins are not affected in the same manner, prompting environmental causes. Trauma to the predecessor tooth, certain medications or infections that can damage the tooth bud have attributed as causative agents for agenesis of teeth. Some have considered tooth agenesis as an evolutionary process. Further, it is considered as a consequence of an obstacle or disruption of the dental lamina and functional irregularities of the dental epithelium or failure of initiation of the mesenchyme. Clinically, the missing tooth will not produce any symptoms except esthetic disturbance such as spacing and migration of teeth into the space to cause malocclusion. When it is an anterior tooth, esthetics will be compromised to a large extent along with some effect on skeletal relationship. With missing posterior teeth, there might be functional disabilities in addition to esthetics. A diagnosis of congenitally missing tooth can be made only after a thorough history, clinical and radiographic examinations to rule out avulsion, trauma or impaction may be necessary. Radiographs have been of great help for diagnosing missing teeth and to evaluate their impaction status. Intraoral radiographs and panoramic radiographs have been utilized to diagnose and confirm the absence of teeth., In the present case, an intraoral and a panoramic radiograph proved to be useful for confirming the absence of the tooth. In contrast to SMMCI, in the present case, although there was only one central incisor present clinically, it was not located in the exact midline or did not show symmetrical morphology. Furthermore, the maxillary labial frenum and incisive papilla were present clinically and so was the intermaxiallary suture. Further, the patient responded to the clinicians enquiries appropriately as would an otherwise normal individual. In addition, he had no systemic abnormalities which are described in association with SMMCI. Hence, it was diagnosed as a rare case of congenitally missing right maxillary central incisor. Genetic testing for sonic hedgehog gene mutation which causes holoprosencephaly would have been a worthy investigation, provided that the patient had at least some features of this disease. When the teeth are missing in the esthetic zone, there can be a psychological impact on the person, especially when it is a child. It is said that the effect is greater during adolescence as the child is already disturbed and confused during those years. Hence, it is important to manage missing teeth at the earliest. If a patient reports to the dentist early in life with congenitally missing teeth, orthodontic treatment can be initiated for space gain for prosthesis. There are case reports where maxillary expansion has been successfully done to gain space for prosthetic replacement. 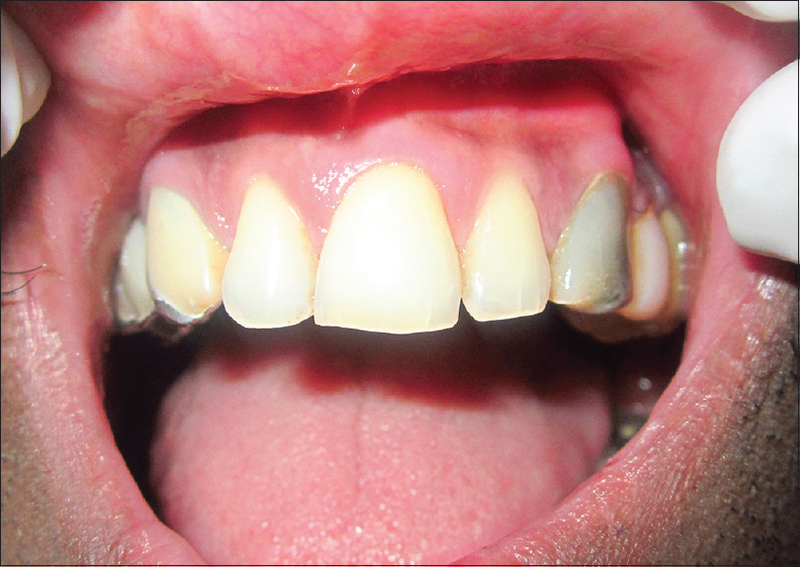 A case where an implant-supported prosthesis replaced the congenitally missing central incisor in an adult patient, using orthodontics is available in the literature. The patient in the present case neither wished for any treatment nor was it required. Hence, no treatment was initiated. Congenitally missing maxillary central incisor is an extremely rare phenomenon and it is probably the most uncommon tooth to undergo agenesis. When one encounters such a case, a careful history and thorough clinical and radiographic examinations become significant. Furthermore, it is important to differentiate congenital tooth agenesis from a more severe and serious form of the disease which is the SMMCI syndrome. Bozga A, Stanciu RP, Mănuc D. A study of prevalence and distribution of tooth agenesis. J Med Life 2014;7:551-4. Rakhshan V. Meta-analysis and systematic review of factors biasing the observed prevalence of congenitally missing teeth in permanent dentition excluding third molars. Prog Orthod 2013;14:33. Patil S, Doni B, Kaswan S, Rahman F. Prevalence of dental anomalies in Indian population. J Clin Exp Dent 2013;5:e183-6. Uzuner D, Celik MM, Toy E, Turkdonmez CO. Assessment of hypodontia in the Turkish patients referring to the orthodontic clinic: A retrospective study. Eur J Dent 2013;7:S9-14. Kim YH. Investigation of hypodontia as clinically related dental anomaly: Prevalence and characteristics. ISRN Dent 2011;2011:246135. Gökkaya B, Motro M, Kargül B. Prevalence and characteristics of non-syndromic hypodontia among Turkish orthodontic patient population. J Int Soc Prev Community Dent 2015;5:170-5. Amini F, Rakhshan V, Babaei P. Prevalence and pattern of hypodontia in the permanent dentition of 3374 Iranian orthodontic patients. Dent Res J (Isfahan) 2012;9:245-50. Hassan DA, Abuaffan AH, Hashim HA. Prevalence of hypodontia in a sample of Sudanese orthodontic patients. J Orthod Sci 2014;3:63-7. Montesinos FA, Linares TS, Pérez-Gasque BM. Accelerated osteogenic orthodontics™ for retreatment of a patient with diminished root length and absence of the maxillary central incisor. Saudi Dent J 2015;27:228-34. Ephraim R, Dilna NC, Sreedevi S, Shubha M. A labially positioned mesiodens and its repositioning as a missing central incisor. J Int Oral Health 2014;6:114-7. Hashim HA, Al-Said S. The prevalence and distribution of hypodontia in a sample of Qatari patients. J Orthod Sci 2016;5:1-6. Venkataraghavan K, Athimuthu A, Prasanna P, Jagadeesh RB. Transposition of mandibular lateral incisor-canine (mn.i2.C) associated with hypodontia: A review and rare clinical case. J Clin Diagn Res 2014;8:ZE04-6. Hall RK. Solitary median maxillary central incisor (SMMCI) syndrome. Orphanet J Rare Dis 2006;1:12. Utreja A, Zahid SN, Gupta R. Solitary median maxillary central incisor in association with hemifacial microsomia: A rare case report and review of literature. Contemp Clin Dent 2011;2:385-9. Shilpa G, Nuvvula S, Gokhale N, Yamini V. Concomitant solitary median maxillary central incisor and fused right mandibular incisor in primary dentition. Contemp Clin Dent 2012;3:S203-5. Yassin OM, El-Tal YM. Solitary maxillary central incisor in the midline associated with systemic disorders. Oral Surg Oral Med Oral Pathol Oral Radiol Endod 1998;85:548-51. Bolan M, Derech CA, Ribeiro GL, Pereira ET, Almeida IC. Solitary median maxillary central incisor. J Dent Child 2009;76:82-6. Tichler HM, Abraham JE. Management of a congenitally missing maxillary central incisor. A case study. N Y State Dent J 2007;73:20-2. Krishnappa L, Shetty J, Reddy V, Shah A, Prasad S, Hedge D, et al. Replacement of a congenitally missing maxillary incisor by implant supported prosthesis. J Indian Prosthodont Soc 2014;14:190-5.